President Obama will be in Vermont Friday for a series of campaign events, and progressive activists in Burlington are organizing to argue that he hasn’t fulfilled his campaign promises made back in 2008. At a meeting Wednesday night on UVM’s campus, members of Vermont’s Occupy movement demanded that President Obama support policies that benefit what they call the 99 percent. Ashley Smith with the United National Anti-War Coalition is an organizer of the left-leaning Occupy movement. He says one of the issues that it continues to advocate for is ending America’s global military intervention. 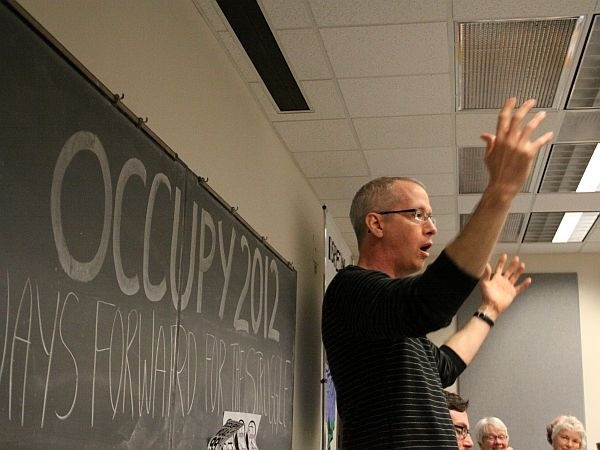 "Obama is not a peace president," Smith told a group of about 60 Occupy members. "The reverse is the case. He came in to salvage a mess that Bush created and to expand the American wars." Vermont’s Occupy movement suffered a setback last winter when its Burlington encampment was shutdown. But UVM graduate student Nolan Rampy says the movement is still smoldering here, and he sees the president’s visit Friday as an opportunity to resist calls from Democrats to rekindle its energy around President Obama’s reelection campaign. "Obama has completely and utterly sold out the left and I think his entire first term has proved that," Rampy said after the meeting. "What he’s shown is that if real change is going to come about in the country it’s going to come from people on the outside protesting the establishment." Occupy Vermont members plan to protest outside the President’s campaign event on the UVM campus Friday morning. This will mark President Obama’s first visit to Vermont while president. The last visit to Vermont by a sitting president was 17 years ago, when Bill Clinton visited in 1995. Middlebury College political science professor Matt Dickinson says visits from presidential candidates are a rarity in Vermont for a number of reasons. "Vermont doesn’t matter very much," Dickinson says. "In general, because we only have three Electoral College votes, and in particular because we’re a very blue state. So there’s no incentive for him or any Republican to spend much time here. " Obama easily carried Vermont in 2008, winning 68 percent of the vote. A recent poll by the Castleton Institute shows his supporters will remain committed to him in 2012.